When he is conceiving the music of Amongst Myselves, Steve Roberts must first describe the aural consistency of the work. On the album Sacred Black, we experience Roberts' knack for contrast; the putting together of varied forms so as to heighten their effect and his ability to establish the connectiveness between tones. The 8 tracks sweep and stumble between sonic states of wordless quietude and opalescent shine to chilling shades of frosted brittleness and impliable density. Roberts is an explorer amidst the vast region betwixt tonality and disonance - his mission being to link the two. Sacred Black can be classified as an album realized using electronic gear, but Roberts draws out of his instruments an incomparable range of frequencies, pitches and sonorities - arranging them into organic, three dimensional shapes. The track "The Shores of the Cosmic Ocean" being the most reassuring, opens with the sounds of surf against the shore and on into the warm glow of synth pads, soft melodies and glistening harmonies. An undertow of musical current pulls us along on our descent into peacefulness. "Sea of Rains" portrays a strange, more somber condition. Synthetic explosions punctuate airy drones. Almost environmental in its stasis, the track seems to move and develop like a storm through its 8 minute course. "The Demon Haunted World" is somewhat unsettling with its rattling chains, dripping effects and melodic chromatism - but we are eventually rescued as the concluding track segues in and brightens up our clouded soundworld with the pleasant strumming guitar of "Returning Home". 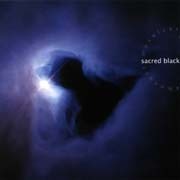 Sacred Black has been endowed with a transcendent quality. The listener feels surrounded and hopefully even liberated by Roberts' designs. This album deals with what is between and beyond dreams and memories. Its areas of translucency provide clarity of vision while the regions of opacity are relatively impervious to understanding. Could it be then that Sacred Black is truly based on all the complexities of the individual.